I mixed everything up in that order in a large mixing bowl. I added a little Coconut Oil to a baking sheet for some grease action and rolled the dough into little balls. Fire up the oven to 350 and cook for 5 minutes and then rotate and cook for another 3 – 5 minutes. They may still look wet-like but they will harden up when cooling. This makes about 2 dozen. 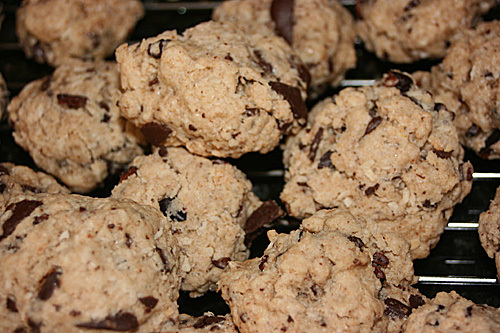 Vegan Chocolate Chip Cookies are delicious!